Joie de vivre as a gift: the Dolce Vita Hotels in Mediterranean South Tyrol stand for vitality, delight, beauty and wellness. You can give away a piece of Dolce Vita with a hotel voucher or products of the hotel-own organic cosmetics range BERG. Christmas is not far and you have no idea what presents to give? How about a piece of South Tyrol? 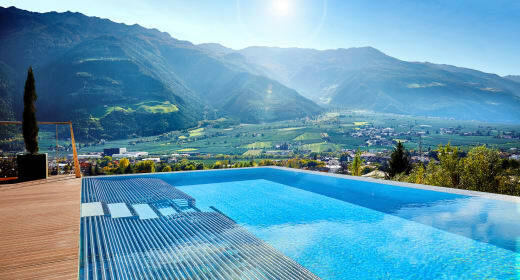 The autonomous province South Tyrol in the north of Italy stands for vitality, Mediterranean climate and alpine jewels. Send your loved ones to Europe’s most beautiful orchard: five million apples are harvest in South Tyrol every year – and the mild climate promotes the growth of many tasty fruits. Spring in South Tyrol begins already in February. Winter in South Tyrol is shorter but more beautiful than elsewhere. There are no queues at the lifts in the small but beautiful ski resort of Merano 2.000: the pistes offer plenty of space for skiers and snowboarders. Give away a piece of Dolce Vita for Christmas: the Dolce Vita Hotels in South Tyrol provide you with the best ideas for gifts! The Dolce Vita Hotels use nature’s power for your beauty. The organic products of BERG Cosmetics contain only natural ingredients. Order the BERG care product range easily and quickly from home through the online shop. Best you order today so that you can give away a piece of South Tyrol in time for Christmas. Gift ideas from your Dolce Vita Hotels – Christmas shopping can be so easy! The hotel team of the Dolce Vita Hotels is happy to provide you with more gift ideas for your individual Christmas gift.